German engineering has a great reputation when it comes to cars, but what about smartphones? Gigaset, a company which started out building landline telephones, but also produces smart home devices and smartphones, thinks "Made in Germany" could be the future of smartphones, with devices produced in Europe instead of Asia. But how does this all work? And why is Gigaset doing this? We went to the factory to take a look. Our journey brought us to Bocholt, Germany, near the Dutch border. There was once a time when 4,000 employees worked there, but now there are only 550 people working on the large site - and a handful of them are building smartphones. The Gigaset GS185 is advertised with the slogan “Made in Germany”. But how much of the work is actually done on site? And could this set a precedent, where smartphones would be produced in other western countries, like in the US? At first glance, the Gigaset GS185 doesn’t appear to be anything special. It’s a classic entry-level smartphone for around 200 dollars, without any world-shaking equipment, but with some highlights like a 4,000 mAh battery and an Android 8.1 operating system. Everything is completely normal, with the exception of the production. Gigaset has built a state-of-the-art production line for smartphones on one floor in one of the smaller buildings on their factory site. Six people work there together, and each person builds smartphones one at a time in their individual stations, but not just by hand. They are supported in every stage of their work by robotic arms from the Danish company Universal Robotics. The robot helps to take the parts and place them in the right place, but allows the human employees to take the lead in many things that require too much dexterity. It is this combination of automation and human components that makes the production different from the manufacturing in Asian factories. In Asia, extremely low wages are the norm, and there are also fluctuations in the quality because the devices are so complex. 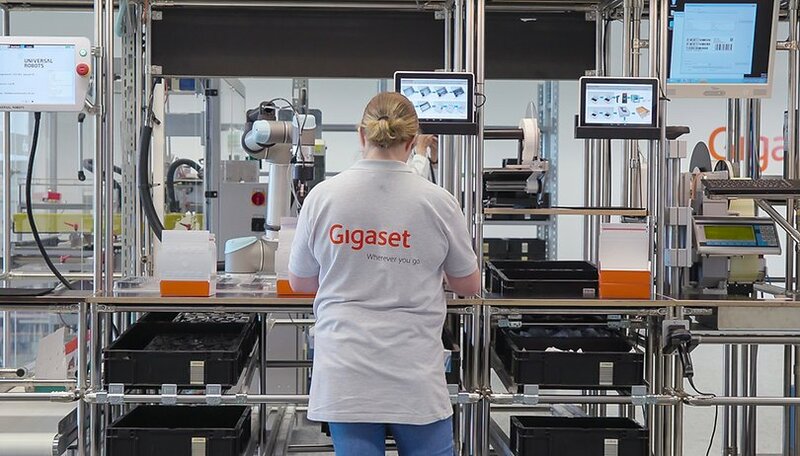 The Gigaset employees know the special place they have in smartphone production, as their work is much more varied than many jobs with fully automated production. And it’s a lot quieter where they work. There are currently only eight Gigaset employees that are lucky enough to build smartphones, along with a team of around twenty engineers and management. Jörg Wissing, head of automation at Gigaset, emphasizes that without the help of robots, the smartphones could also be built in Bocholt, but not at the low prices that can be achieved with the current technology. The truth about this smartphone, however, is that all the individual parts come pre-assembled from Asia, and in Bocholt the parts are assembled, tested and packed, and the operating system is also installed. Only the cardboard and operating instructions are actually “Made in Germany”. There are simply no suppliers producing components in Europe, but Gigaset could manufacture the plastic parts itself. The company is also considering this, but currently lacks the capacity for injection molding machines. Gigaset prides itself on the fact that its smartphones can easily be adapted to customer requirements. This allows you to quickly add your own elements to the installed software. Part of the production includes a laser device that engraves logos or even the name of the owner on the back of the frame: a nice service that some customers will certainly appreciate. The facility doesn’t require any crazy logistics, since all of the production takes place on one floor. Not only are the smartphones also repaired there, but all Gigaset products are. This is another advantage of the site: every defective smartphone is repaired within one day and then leaves the factory again, according to the service manager. This eliminates long transport routes and weeks of turnaround times, which you’ll find in large repair centers. Anyone who takes a look at the smartphone production at Gigaset in its current state will reach the same conclusion: this isn’t much more than a first step. There’s no assembly line in a large hall, and the work seems quite leisurely. The individual workers keep busy at their own stations packing smartphones. The employees even glue the boxes by hand. In the meantime, the robot arms remain still for long periods of time until the next smartphones comes to them. But that’s not the end of the story. The second production line is already being set up directly next to the first, and a third is being planned. There’s space on the floor for a total of six. With the change to three shifts and round-the-clock production, Gigaset could already produce three times as many units. If there’s more demand, the company would be able to build up their production relatively easily. The difference between these new devices and the old, fully automated production of DECT telephones, which we were also able to see at Gigaset, is astonishing. The robots are smaller, more modern, smarter and more interactive than the large machines in the production of landline phones. Of course, they also have to perform other tasks, since in Hall 50 the parts are assembled, the software is installed, plastic parts are also manufactured in self-made molds and blanks are fitted with all the necessary components. Thanks to the pre-assembled components, the requirements for smartphone production in Bocholt are quite different. The modern production lines are surprisingly inexpensive for the company. While a complete system for the fully automated production of DECT (cordless landline) telephones costs around 8 million euros, the smartphone line itself only costs under a half million dollars, including the robot arms and all the measuring devices. Of course, Gigaset doesn’t do all this out of nostalgia or charity, even if the preservation of jobs is a key aspect of the traditional company’s agenda. There are many reasons to manufacture smartphones domestically. Stephan Mathys, finance director at Gigaset, emphasizes the same points as his colleagues: local production leads to better quality with less waste, can react more flexibly to market and customer requirements, and offers better and faster service, not to mention that it secures jobs and is more environmentally sustainable. However, the most important advantage for Gigaset is the unique selling point offered by the “Made in Germany” label. In a market as difficult as the smartphone market, which is dominated by three large companies, it is difficult for a small fish to survive in the big pond. The local touch of Gigaset smartphones, which should become even more pronounced in the future, together with their decades of experience in the industry, should ensure that Gigaset can secure a small but significant chunk of the market in the long-term. And not just in Germany, since Gigaset already offers its smartphones in other European countries, and soon Russia, Argentina, and other markets will be added. I like Gigaset's idea of manufacturing smartphones locally. If the concept proves to be successful, the company will likely be able to move away from solely offering inexpensive entry-level devices. Oliver Kinne, global sales and marketing manager for the mobile division at Gigaset, said in an interview that the company is also looking at higher price classes if they’re successful at the lower price ranges. Gigaset is expected to present another “Made in Germany” smartphone before the end of the year, possibly at the IFA. This is why they’re building a second production line. It’s still exciting to see the direction Gigaset is going. So far, the “Made in Germany” is the first small seedling that still needs to be properly nurtured. But who knows, maybe in the future it’ll grow into a mighty tree. What do you think of Gigaset’s idea? Should companies in the US, UK and other countries also start offering "homemade" devices? Unless that Smartphone is 100% "Heche En Mexico" - which I'm not opposed to, provided they were factories run on green power / not illicit sweat shops - it would be no different than what's currently done with car parts "Heche En Mexico" sent to America for assembly into Cars. These are ASSEMBLED in Germany, not made in Germany. All components are made in China, apart from the instructions manual and carton package! Ha! I am surprised that german/european law allows them to advertise that its "made in Germany"! What if phones were made outside of China? They'd be TOO expensive for most consumers to stomach. Hard to get regular people to work in conditions that prevail in China. Oh, their factories look clean on TV, but it's the "dormitory" forced lifestyle most of their "subjects" live in that's the killer. gigaset are Not manufacturing smart phones locally... sweat shop workers in the far east are the manufacturers. Motorola tried that with the Moto X. Made in the US. Nice article, I want that Gigaset smartphone company starts their manufacturing unit In India Also. Let's just hope and pray this phone has a replaceable battery - the single biggest (and increasingly common) fault in ANY battery-powered device, be it a smartphone or a carpet sweeper. Imho, replaceable batteries should be required by law. Agreed. But you run into problems with products that have to be waterproof (eg, electric toothbrushes). How do you maintain the seal?